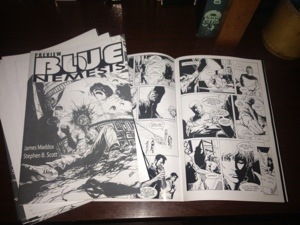 Today and tomorrow, I’m handing out a booklet of the first 16 Blue Nemesis pages to editors and publishers. With the art and story, I don’t see how they could pass it up! This entry was posted in Blue Nemesis and tagged Blue nemesis, Comic Reading, Conventions. Bookmark the permalink.